I’ve already been experimenting with DIY smart speakers and corresponding services for example using ReSpeaker board with Microsoft Bing Speech API, or Orange Pi Zero with Google Assistant SDK. But so far all the hardware platforms I used only came with one microphone, no microphone array that help with wake word detection in noisy environments. Development Kit for Amazon AVS, but since I’m going to use a board based on ZL38063 I’d thought to have a closer look to better understand its capabilities. Enhanced far-field support for distances up to 16 feet (~5 meters) from the microphone. The block diagram also reveals the chip can be connected to speakers, and interface with the host processor over I2S/PCM to send PCM audio, and I2C or SPI for commands. It also supports an optional external SPI flash. Applications for such chip not only include smart speakers, but also smart home gateways, set-top boxes, digital assistants, basically anything that may require voice commands detection. You’ll find documentation and software on the product page, but most of it is only accessible after registration. It’s free, but you need a company or university email address, and after email confirmation wait for the company to accept your application. Back to Espressif Audio Mic HDK. 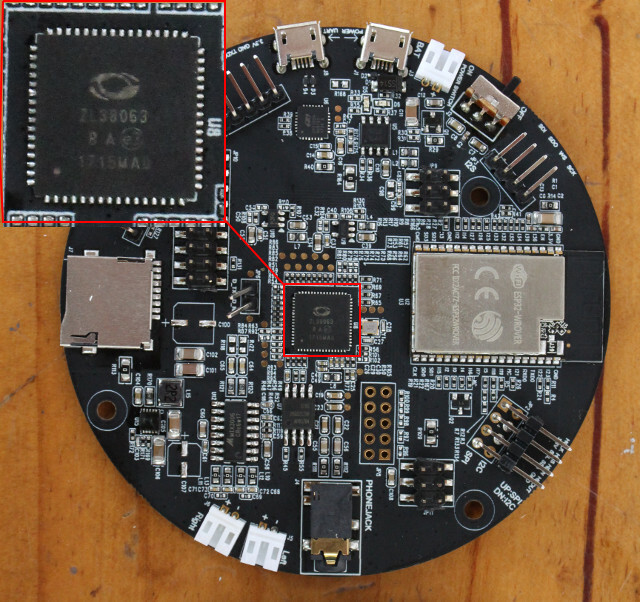 Espressif claims keyword recognition runs on the Espressif ESP32 module, so that means the MicroSemi ZL38063 chip does not perform the wake word detection by itself, but instead assists the host processor by processing the audio with specific algorithms that make detection more accurate on the host processor. Tweet I’ve already been experimenting with DIY smart speakers and corresponding services for example using ReSpeaker board with Microsoft Bing Speech API, or Orange Pi Zero with Google Assistant SDK….